An earthquake of 3.6 Richter magnitude scale and another slightly lighter hit this morning South Albania. The 3.6 quake is felt mostly in the Berat, Kuçova, Fier and Ballsh areas. 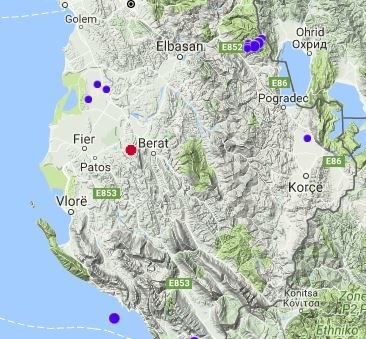 The Albanian Geoscience Institute reports that the earthquake epicenter was 9 miles northeast of Ballsh and 2.4 km southeast of Berat at a depth of 16 kilometers. While the next earthquake of 3 Richter magnitude scale had its epicenter 17 kilometers southeast of Saranda, at a depth of 3 km.